Lots of people have pets in their homes. Some prefer dogs, some prefer cats, and some are partial to goldfish. Most people agree on one thing – pets are adorable and bring a lot of joy into our homes as well as our lives. But it is not all rainbows, as sometimes our pet can cause us problems and complications. For example, pets' hair. When our pets shed their hair, it is very important to clean it on a regular basis, as it can accumulate, while spreading to every room and every corner. Accumulated shed hair can cause, besides the mess, health problems, affecting the respiratory system, causing allergies, and bringing about other unwelcome side effects. When you choose not to clean the fallen hair on a regular basis, you will need the help of professionals to do so, as pets' hair also tends to stick to things (especially fabric) and so it will stick to the furniture, beds, sheets, curtains, carpets and so on. Removing pets' hair is not only important in order to keep your house clean, but also in order to allow the air duct system to work properly as it will find its way there, also. That's why our team will make sure that the hair will be removed not only from the furniture, carpets and curtains, but also from the ventilation and air conditioning system. If it won't be completely clean, it might lower the air quality within the house and even lead to breathing difficulties and asthma complications. When the needed service relates to the wellbeing of your family, even indirectly, it is most recommended to hire only professionals, so you'll be sure your safety is in good, capable hands. When our team delivers pet hair removal services they will ensure that all traces of shed hair are removed, while ensuring all areas are left spotlessly clean. When you call for our services, we will send only experienced professionals to provide you with great customer service, head-to-toe, until you're satisfied with the services you've received. Additionally, our solutions are offered for affordable prices and are available for both residential and commercial properties. So, whether you need your home cleaned or your business scrubbed, you're more than welcome to call us and we will gladly be at your service. How difficult is it to remove pet hair from furniture? If you own a cat or a dog you know that along with the pleasure that they bring to your household, they also bring the ongoing struggle with removing their hair from furniture. 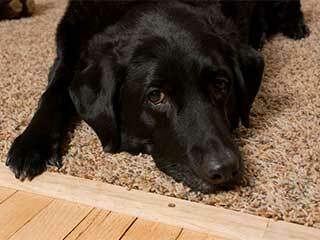 The loose strands of their fur can easily stick to sofas and carpets, and be a real pain to get rid of. If someone has allergies or other respiratory issues, it's very important to get rid of pet hair regularly. All in all, if you want to decrease the amount of hair spreading in your home, brush your pets regularly with a special type of grooming brush, and give your dog a bath every now and then, and maybe the occasional haircut.